This is the last part of a section in the issue that appeals to everyone to get involved. Integrating Huxley’s call to ATTENTION, from Island, which appears throughout the book, for added emphasis. Armed revolutions aren’t a solution. to the corruption of the revolutionaries. Marxism is a failed experiment. Che is a symbol of the past. Don’t expect someone else to liberate you. This text also appears in a condensed form on the back of the sticker version. 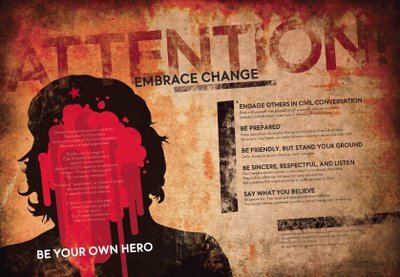 This visual essay is titled “Embrace Change” and includes a few simple guidelines for engaging others-particularly people with whom we may disagree, in civil conversation. I believe civil engagement is the foundation for substantive change. It’s not about changing minds on issue as much as building mutual respect and civil dialogue. Right-wing talk radio has been at the forefront of reducing dialogue to shouting matches. The vicious decline of quality discourse they have led has now become a prominent feature of the standard Television media, and adds nothing of real use to any serious debate on the issues. We cannot wait for the media to move past this…. we must demand it by example, by refusing to accept such reductive blather. There is no finish line. This is a permanent endeavor. The goal to move past both reductive methods of discourse as well as outmoded symbols for change. The guidelines came directly for the writings of George Lakoff, a professor of cognitive linguistics at the University of California, Berkeley. He has written extensively on the subject of framing issues and the ideological divide between conservatives and progressives. I encourage everyone to read some of his works, most notably: Moral Politics, The Political Mind, Thinking Points and Don’t think of an Elephant. consider multiple views. Learn how to discuss and frame topics. Know your issues thoroughly. Recognize how others frame their views. Be sincere. Use frames you really believe in, based on values you really hold. Smile, always be on the offensive, never complain. Don’t negate another person’s view—don’t try to change their mind. Respond by reframing the issue from your perspective. Ask questions that might encourage or challenge them to think. Be passionate. Your body and voice should show optimism. You should convey passionate conviction without losing your composure.